Info: 3 BR, 3 BA Waterfront Home with 1621+/- s.f. Island Tower waterfront condo for sale in Gulf Shores Alabama. 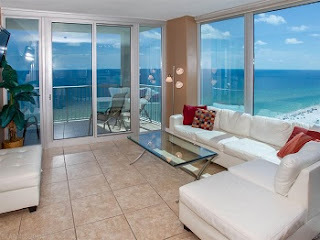 Beautifully appointed gulf front condo offers expansive unobstructed views overlooking the Gulf of Mexico. Luxury at it's finest. This west corner condo features: tile flooring throughout, 9' floor-to- ceiling windows with panoramic views, crown molding, recessed lighting, gourmet kitchen with granite countertops, custom cabinetry, updated fixtures and all stainless steel appliances, private gulf front balcony can be accessed from both living room and master bedroom. Spa like master bathroom offers dual vanity with his and her sinks, Jacuzzi tub and separate stand up shower. Guest bedrooms both have private bathrooms and access to their own private balcony. Gorgeous views from every room. Prime location in the heart of gulf shores. All within walking distance to shopping, restaurants, festivals, beaches and more. Turn key and rent ready. First class amenities to include: indoor and outdoor pool, outdoor shower, private boardwalk for easy access to beach, sauna, fitness center and BBQ area. Don't miss your opportunity to own a piece of paradise.